I hope you had read my previous post on Unboxing The Herb Boutique Box which I had received sometime back. So today am going to review the first product in that which is The Herb Boutique Natural Treasure Green Tea & Eucalyptus Body Polish. I have been using it for almost 3 weeks now and let’s see how it fares on me. Specially handpicked tea leaves blend together with citrus juice and eucalyptus oil gives your skin the desired nourishment it needs. The product comes in a regular jar packaging. They have provided a wooden spoon and hand towel as well which is really appreciated. 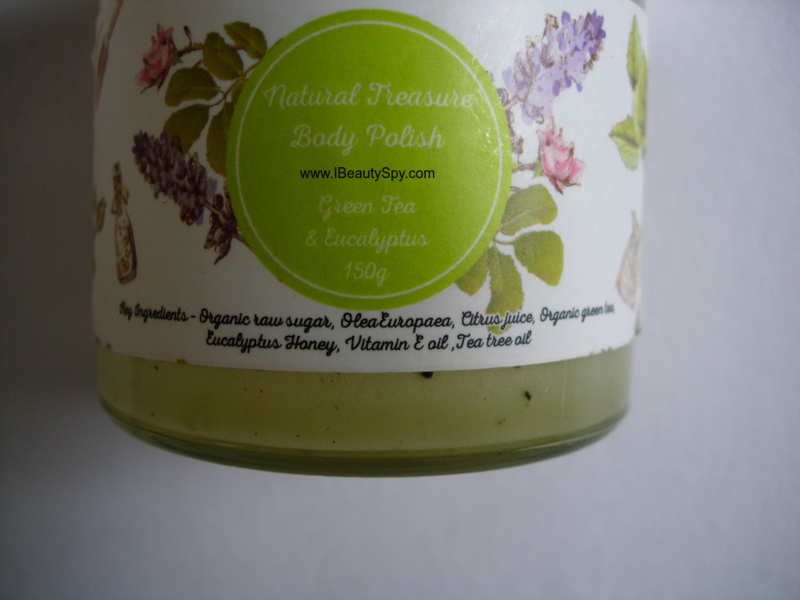 The Herb Boutique Natural Treasure Green Tea & Eucalyptus Body Polish looks light green in color and has some tiny black particles in it. It has a very relaxing scent of warm eucalyptus oil. Now I love the smell of eucalyptus oil and often use it for headache and cold. But for those who don’t like this smell, I would advise you to skip this product. 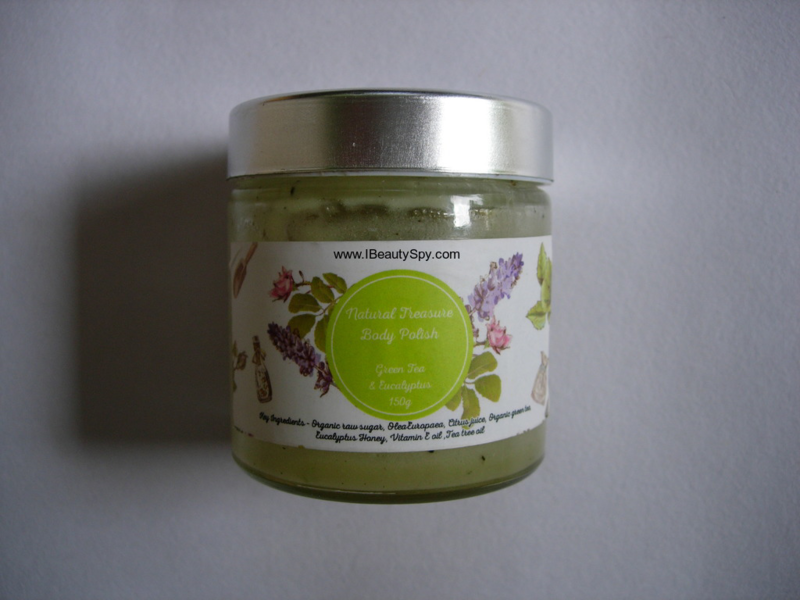 The Herb Boutique Natural Treasure Green Tea & Eucalyptus Body Polish has a thick, sticky jam like consistency. I think it’s the addition of honey which makes it kinda sticky. 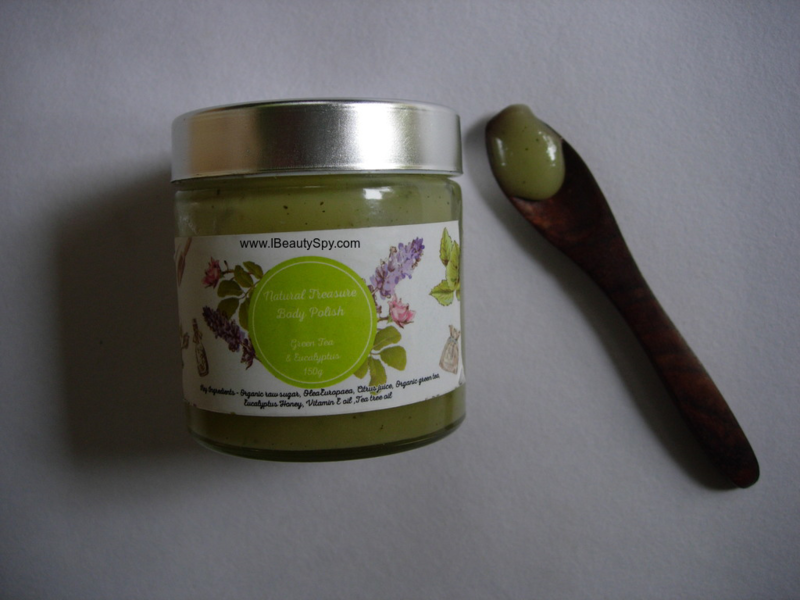 Due to this, it is difficult to spread the body polish and hence more quantity required each time. The body polish has fine powdered sugar which does not feel harsh on the skin. It scrubs away dead cells and melts quickly. 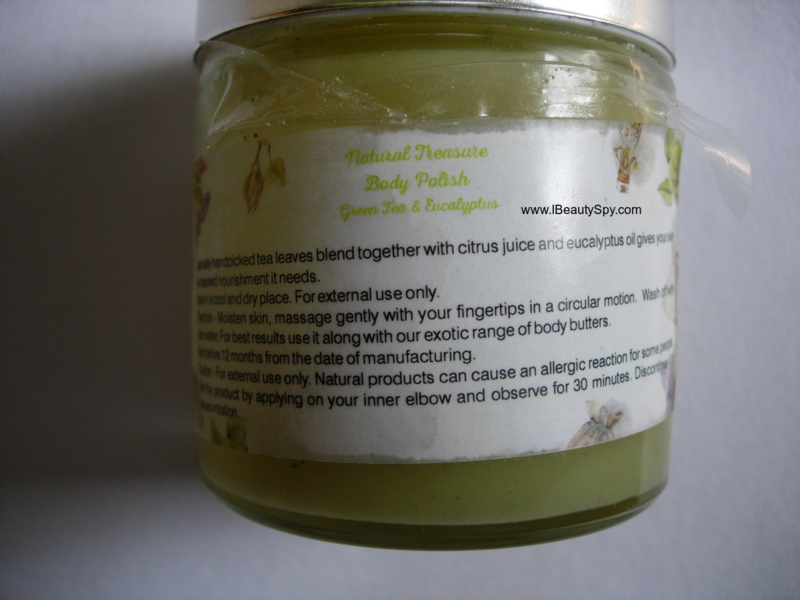 The green tea, citrus juice, eucalyptus oil and tea tree oil deep cleanses skin and leaves it fresh and squeaky clean. The vitamin E oil keeps skin moisturized without drying it out. However, I find this is not as moisturizing as some of the body scrubs available in the market. Its more of a clarifying, refreshing and deep cleansing scrub. Its best to follow up with a body lotion or body butter. The addition of eucalyptus oil gives a warm feeling to the skin and hence its perfect for winters. I don’t have any complaints about the product, except that its very expensive. Considering that there so many natural and organic brands nowadays with affordable options, this surely has a hefty price tag. I would buy this if it were priced at Rs.500-600. Yes, it satisfies its claims. • Warm and relaxing scent of eucalyptus oil. 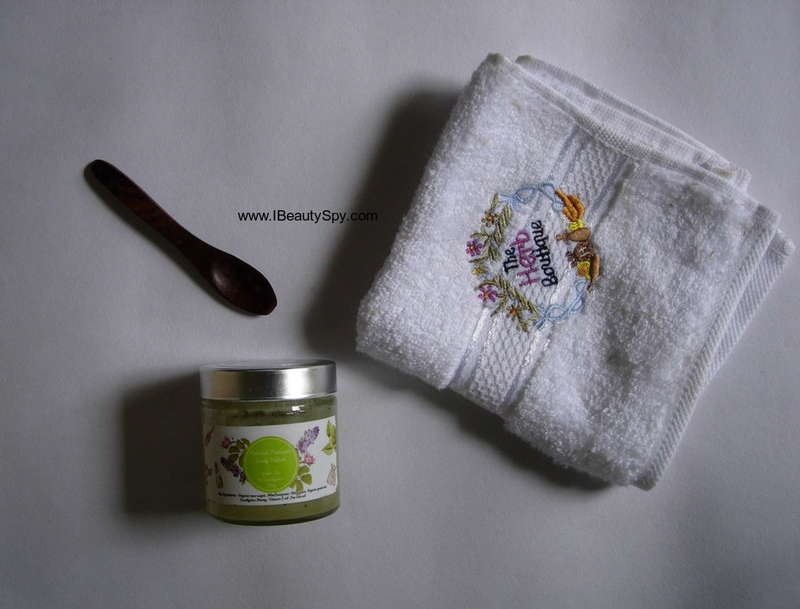 • The scrub particles are not harsh and gentle on the skin. • Deep cleanses and clarifies skin giving a squeaky clean feeling. • Impressive list of ingredients. • The presence of eucalyptus oil gives a warm feeling which is ideal for winters. • Wooden spatula and hand towel are provided. • Adjust the consistency. Thick jam like consistency which doesn’t spread easily leading to more quantity being used every time. • Too expensive. Lower the price. • Mention all ingredients instead of only key ingredients. Not for this price. You can get it maybe when its on sale or discounts. Maybe when its on a sale. No. This is definitely expensive compared to other body scrubs available in the market. Also, it lasts only for few uses as more quantity needed each time. I enjoyed using this warming body scrub this winter. It has a great ingredients list. But I wish they lower the price as its too expensive and there are many more brands offering similar products at affordable price. Ohh that’s a hefty price tag. Yes, it is expensive. I don’t know why they are priced so high when there are so many new brands nowadays coming up with affordable skin care products.